Volunteers and clinicians with health insurer MMM deliver supplies to residents of the town of Morovis located in the central region of Puerto Rico in the aftermath of Hurricane Maria. SAN JUAN, PUERTO RICO—On the evening before Valentine's Day, shoppers flock to Plaza las Americas shopping center in the Hato Rey neighborhood of the island's capital. 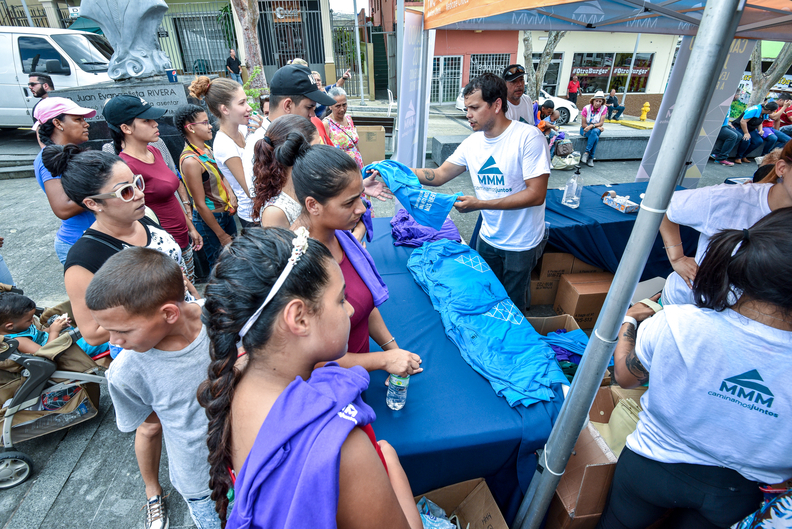 At first blush, much of the city has recovered five months after Hurricane Maria. Inside San Juan's largest shopping center, there's an inconspicuous corner storefront that serves as a reminder of one of the island's most pressing issues. The sign on this storefront reads "Recargate" or "Recharge." What started off as a temporary charging station for electronic devices has become a makeshift clinic. Recargate, a storefront inside Plazas Las Americas shopping center that serves as a clinic and meeting place for those affected by Hurricane Maria. Here, a subsidiary of New Jersey-based InnovaCare Health offers physicals and referrals to specialized care services. InnovaCare runs one of the island's largest Medicare Advantage health plans, Medicare y Mucho Mas. MMM set up Recargate in November and displaced Puerto Ricans flocked to the site, looking not just to refill their batteries but to find counsel and care. More than 20,000 people have visited Recargate in the past three months. Not surprising as dozens of doctors offices in San Juan remain closed despite having regained power. Hospitals throughout the island were damaged and the hurricane's aftermath added pressure to a decadeslong trend of healthcare professionals leaving for the mainland. Upon Recargate's opening, MMM President Orlando González emphasized the need to address what he called Puerto Ricans' "specific healthcare needs" such as disease prevention and drug management. According to a 2017 report by the Urban Institute, heart disease and diabetes are two of the leading causes of death in Puerto Rico. "They also face the need to have a space for recreation, in a central and safe place to recharge, both physical and emotional," Gonzalez added. Recargate offers educational seminars and workshops to promote wellness, as well as regular exercise classes. Behavioral health specialists are periodically on-site to conduct mental health screenings and counsel visitors on depression, anxiety and grief. Corporations have also donated food and drugs to distribute. Employees at the center offer help to visitors applying for social services. About 130 people—80% of whom are elderly—visit Recargate every day, said Vivian Arthur, vice president of corporate social responsibility and community outreach at MMM who runs Recargate's day-to-day operations. The elderly, especially those who are evacuated during storms, are acutely vulnerable following disaster. Public health administrators have estimated that 10% of elderly people who survive an evacuation die within eight weeks as a result of stress. The demand for Recargate's services led MMM to delay its original date to close from Dec. 31 to March 31. Arthur said they may even keep it open longer if needed. "A lot of people lost their families because they had to move to the states, or a lot of people suddenly had 10 people in their house, and they didn't know how to deal with a senior or a kid," Arthur said. "What we're trying to do here is to promote their emotional well-being." Annette Rodriguez, vice president of corporate communications at MMM (left), and Vivian Arthur, vice president of corporate social responsibility and community outreach at MMM, at Recargate, a temporary clinic located inside Plazas Las Americas, in San Juan, the largest shopping center in Puerto Rico. Recargate has also served as a pilot of sorts to address the island's population-health needs, according to Dr. Richard Shinto, president and CEO of InnovaCare. He said the company's outreach efforts have identified how poverty, housing instability and lack of transportation affect health outcomes. "If they go home and they can't get that diet or have no place to stay or have no way to get the medication they were prescribed, everything you've done in the clinic has been lost," Shinto said. InnovaCare began running several mobile clinics two weeks after the storm. More than 30 clinics have been set up over the past few months, and the services they offer have changed over time from addressing immediate health concerns to longer-term necessities. Medicaid and Medicare are paying for the medical services provided to patients. More than 25,000 residents have received care from the clinics. Patients were seen by either a primary-care physician or a physician specialist, and they were diagnosed and prescribed medications as needed. Patients get their prescriptions filled by an on-site pharmacist. Doctors with MMM visit with residents of the mountainous, rural town of Gurabo in the eastern half of Puerto Rico as part of their mobile health clinic initiative started two weeks after Hurricane Maria hit the island. Annette Rodriguez, vice president of corporate communications at MMM, said other outreach efforts have included conducting home health visits to elderly residents and deploying teams to more than 60 municipalities throughout Puerto Rico to distribute supplies and provide mental health support. How and when hospitals on the island are truly able to recover will determine whether or not a healthcare safety net already teetering on the brink ultimately collapses or can become stronger than it was even prior to Hurricane Maria. COMING UP: A look at the challenges three hospitals face as they begin their long road to recovery, and how those efforts are being hindered by ongoing payment delays of their insurance claims.